(Nanowerk News) Research by Rice University scientists who are fighting a cyberwar against cancer finds that the immune system may be a clinician’s most powerful ally. “Recent research has found that cancer is already adept at using cyberwarfare against the immune system, and we studied the interplay between cancer and the immune system to see how we might turn the tables on cancer,” said Rice University’s Eshel Ben-Jacob, co-author of a new study this week in the Early Edition of the Proceedings of the National Academy of Sciences ("Modeling putative therapeutic implications of exosome exchange between tumor and immune cells"). 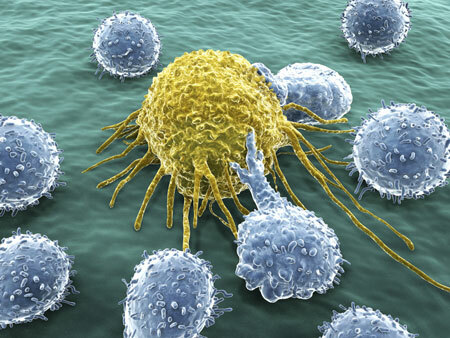 A cancer cell under attack by lymphocytes.